John Anthony Aniston was born as Giannis Anastasakis on the 24th July 1933 in Chania on the island of Crete, Greece. 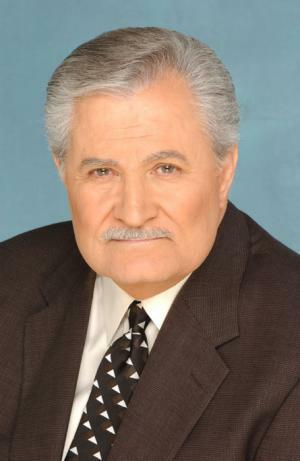 He is an American actor, who is certainly best known for his appearances in the role of Victor Kiriakis in the TV drama series “Days Of Our Lives” (1986-2016), which is aired on the NBC channel. He is also recognized as the father of Hollywood actress Jennifer Aniston. His acting career has been active since 1962. Have you ever wondered how rich John Aniston is, as of mid- 2016? According to authoritative sources, it has been estimated that the total size of John’s net worth is as high as $10 million, which has been accumulated through his successful involvement in the entertainment industry as a professional actor. John Aniston was raised with three siblings by his father Antonios Anastasakis and his mother Stella Joanne. When he was two, his family moved to the USA, where they opened a restaurant in Chester, Pennsylvania, and his father decided to anglicize John’s name for easier pronounciation. After matriculation, he became a student at Pennsylvania State University, from which he graduated with a BA degree in Theater Arts; he was also a member of Alpha Chi Rho fraternity. Right after college, John joined the US Navy, and he spent some time serving in Panama as Lieutenant Commander. John’s professional acting career began in the 1960s, with appearances in brief roles in several TV series, such as “87th Precinct” (1962), “Combat!” (1964), “The Virginian” (1968), among others, all of which increased his net worth, and also helped him build his career. In 1969 he was selected for the role of Eric Richards in the soap opera “Days Of Our Lives”, and stayed in the show for a year. After that, he became a part of another soap opera – “Love of Life” – in 1975 in the role of Eddie Aleata, but left the show after three years, but continued with soap operas, this time with the part as Martin Tourneur in “Search for Tomorrow”, increasing further his net worth. This role lasted until 1984, when he decided to leave and return to the “Days Of Our Lives”, this time in the role of Victor Kiriakis, and since then he has been a part of the show, which clearly represents a large part of his net worth. To speak further of his accomplishments, he has also made several film appearances, including in “Night Sins” (1993) with Matthew Ashford and Crystal Chappell in lead roles, “Sands Of Oblivion” (2007), “Fixing Rhonda” (2008), and “Return To Zero” (2014). John has also had recurring roles in such TV series as “Star Trek: Voyager” (2001), “The West Wing” (2002), “Gilmore Girls” (2002), and “Mad Men” (2010), among many others, all of which have increased his net worth considerably. When it comes to speak about his personal life, John Aniston has been married to actress Sherry Rooney-Aniston since 1984; the couple has a son and their current residence is in Los Angeles, California. Previously, he was married to model and actress Nancy Maryanne Dow (1965-1980), with whom he has a daughter, Jennifer Aniston, who is also an actress. 1 This is a business. Be smart. Choose wisely. 2 Why thrust your kid into that? You try to protect them from all the bad people out there. 3 In show business, you get chewed up and spit out. 1 Grandfather of Ryat Aniston. 2 Father-in-law of Adriane Hallek. 3 Has two sisters, Mary Aniston and Helen Aniston. One brother, Gustau Aniston. 4 Son of Anthony Aniston and Stella "Yiayia" Joanna Aniston. 5 Ex-stepfather of John T. Melick. 6 According to the DVD commentary from the first season of Mary Tyler Moore (1970), he was supposed to play the role of Ted Baxter before Ted Knight was found. 7 Best friend was Telly Savalas, who was also daughter Jennifer Aniston's godfather. 8 Served in the US Navy as an intelligence officer on active duty in Panama and later in the reserves attaining the rank of Lieutenant Commander. 9 Graduated from Penn State University with a BA in Theater Arts. 10 He has acted in over 40 theatrical productions including his debut in the Broadway musical "Little Mary Sunshine" and the Hollywood production of Arthur Miller's "Death of a Salesman". 11 Speaks fluent Greek and Spanish.